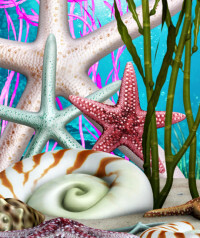 Ocean Treasure Graphics, sea shells, star fish, pearls, kelp, and sandy base clip art images to help you create the ocean scene of your dreams. 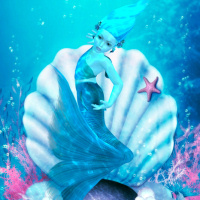 Little Mermaid Graphics, as graceful as ballerinas beneath the waves. They’re adorned with shells, sparkling pearls, and other deep-sea treasures. Fantastic Mermaid Graphics. Make waves this season with this collection of gorgeous, digitally painted mermaids. These deep sea beauties speak paradise.